Location Location Location *Renovated Condo*Southern Exposure*Near Pool* New Kitchen and bathrooms! Just read the reviews! This is one of the best locations in the sought-after Monterey Country Club. Monterey CC is an established gated community minutes from restaurants, shopping, and unlimited activities, this attractive condo truly is your all-encompassing desert oasis! 155 Gran Via is located on a lush green belt with Mountain views - no stray GOLF BALLS! This prime location is just a short drive/walk from the Gran Via south gate, and offers quick and easy access in and out of the Monterey Country Club grounds. You can enjoy dinner at Tommy Bahamas or shopping along world famous El Paseo Drive in 5 minutes! Our 1300 sq. 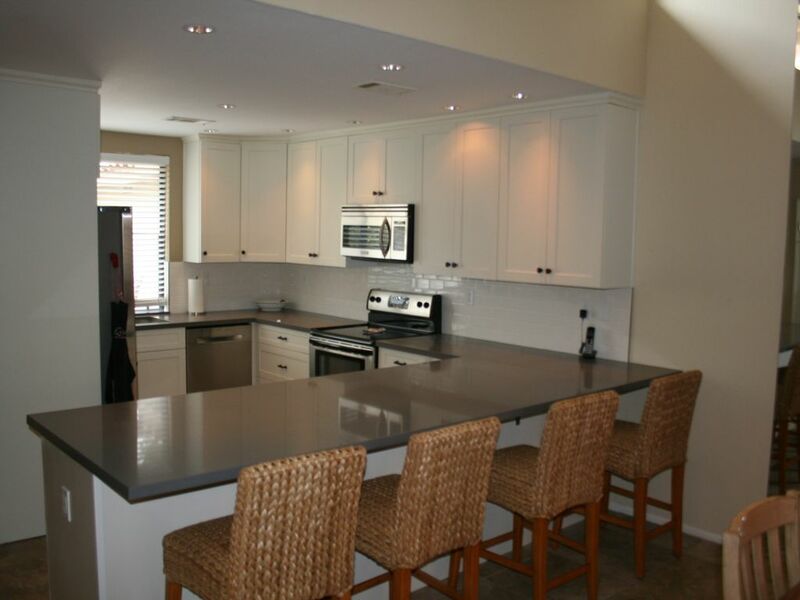 ft., newly renovated 2-bedroom condo is situated on a lush green belt just off the golf course. Spacious living areas include: vaulted ceilings, new furnishings, beautiful tile floors throughout, a generous dining area, and a brand new, fully equipped kitchen (2016). In addition, there are 2 bathrooms (renovated June 2017 - master ensuite and guest bath), double garage, laundry, poolside patio, and private courtyard equipped with seating and a Weber Gas BBQ! The pool and hot tub are literally steps away and the southern exposure is unbeatable! To ensure your comfort, our master bedroom boasts a comfortable king-sized bed, en-suite, TV/DVD player, and its own sliding door to the poolside patio. The second guest bedroom also has its own private bathroom as well as two twin beds, which conveniently convert to a second king-sized bed if that is your preference. All linens, towels, and pool towels are included for your stay. In addition, a recently redesigned courtyard reflects a southwestern theme, and is the perfect spot to enjoy the morning sun or stargaze on a warm night in a cozy, private, setting. Whether you are an avid sports enthusiast, shopaholic, or just someone looking for the perfect setting to relax and enjoy the California sunshine, our desert condo is guaranteed to provide you with both the luxury and comfort you deserve on your vacation! Please contact us for further information and pricing. Palm Desert Tax 11% for bookings less than 28 Days. Keywords: Free Wi-Fi + Free Long Distance Calling in North America + Very Comfortable + Best Location..
OUR #1 Favorite holiday spot!!! Condo Located on the Greenbelt. No Stray Golf Balls to Worry About! Summer month renters are responsible for AC. One of the nicest condos one could wish for. Quiet, clean and very comfortable. We enjoyed this unit in Oct/Nov 2014 for 4 weeks and have nothing but positive things to say about the owner or the unit. Everything was as described. We have been visiting Palm Desert for a good number of years now and this was the first unit we rented that we did not have to clean for two days upon arrival. We will definitely try to book again. Thank you David and Heather for sharing your beautiful place with us. We enjoyed our 3 weeks in Monterey Country Club in this very nice condo. The pool location just off our patio was fabulous. The summer golf rates are remarkable, so there were many days spent playing golf all over Palm Springs. We hope to return next summer and stay for a month! Found everything in great shape, just as you said. Your condo here is really nice, we rarely find units offered for rent so tastefully decorated and in such good condition. We are very happy with accommodations and are looking forward to a great stay. We found the condo to be as described, clean, spacious, well equipped and tastefully decorated. With front and rear patios we could always find a suitable place for sunning, relaxing or outdoor dining, not to mention happy hour. The location is excellent, close to a large mall, movie theaters, grocery stores and restaurants. Monterrey Country Club is beautiful and well maintained. We enjoyed long walks, the swimming pool and spa and dining at the clubhouse. Everyone we met was very friendly. We would be happy to recommend this condo to anyone looking for a relaxing stay in beautiful surroundings and hope we have an opportunity to return at a future date. The property was excellent with two large bedrooms and baths. Location of the pool from the property was no more than 20 steps, which allows you to leave your personal property on your own patio and head over for a quick dip. There is a front and rear patio area, which offers shade at dining time. In general, the condo is centrally located for easy access to great golf courses and if you like tennis under a 5 min drive to some tennis courts that have evening lighting. The condo was clean, comfortable and well furnished for the comforts of home. We definitely would rent this condo again!! the condo was clean, very well equipped and the location was excellent. Everything was as stated by the owners and all that was needed was on hand and the beds were very comfortable. Lots of towels for use and for the pool. I would recommend this highly to anyone wishing a rental at the Monterey Country Club and I look forward to being able to rent there again.